KayKiSpeaks.com: JayZ & Beyonce Party in Vegas! Mr. & Mrs. Carter had a night out on the town in Vegas recently. Surrounded by adoring fans and Cirque Du Soleil performers, Jay, Bey, & Baby Jayonce attended the premiere of Michael Jackson THE IMMORTAL World Tour- Beyonce still in heels of course! More pics when you read on! Global Grind reported that Jay went out a bit by himself once the night carried on. We cant expect a pregnant woman to keep up with him all night on the scene. 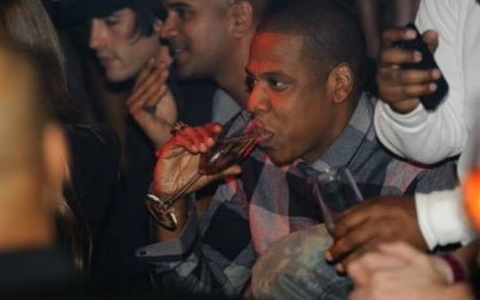 Jay was spotted out partying at another nightclub once they left the premiere. Nobody reaally knows how far along Bey is, but she is absolutely preggers-look at that face!